Andy is the best. We needed to move our appointment many time to beat the rain. All done, and we are so happy! helpful.I would recommend them to anybody. Thank you! Very effective & safe treatment! We had a huge ant problem inside & around our home. Hearts took care of the problem in one visit. They were very courteous & helpful. Very respectful and responsive to all of our needs. Luis was great and very honest. In fact, do you guys do termites too? I want to hire you to inspect for termites. Thanks,Don Levine. Thanks for the kind words about Luis, unfortunately we are not licensed to do termites. Superior services. Professional and courteous personnel. Great company to work with ! Hearts has been our pest control service provider for over 10 years. They offer many “green” options as well as humane methods to eradicate pests. I highly recommend Hearts Pest Control. I can't say enough good things about Hearts Pest Management! Their team is incredibly knowledgeable and considerate of each property they treat. I came to them with a unique pest infestation and their expertise saved us! They go above and beyond to make sure you are satisfied with their services and most importantly, happy in your home. I’ve been very happy so far. They are in and out, mostly unnoticed. I had recently switched from a conventional pest service, and have not noticed any difference, except I know that I’m making a difference for the environment. Once, they had to reschedule, due to rain, and the phone call was very courteous and I appreciated it. Great job, service, and company. Everyone from Hearts Pest Management is professional and responsive. I always get a call 2 days ahead of scheduled service, reminding me to leave my gate open and windows and doors closed. Good people, good price, good results!! Excellent job explaining the issue. 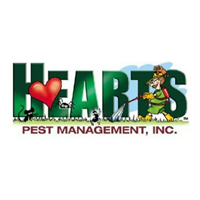 We have been using Hearts Pest Management for the last several years for different properties. The service has been great and professional. We have not had any issues during the whole time we have been with them. Once you understand their process it might be better, I don't know yet. I don't like being called one day prior to service. What if you're out of town? You get a bill, but you never opened your side gate for service. Great service! They always go above and beyond! Hearts is great! We have the green thumb monthly package. We get a phone call the day before to let us know they're coming and then we know to keep our dogs inside. The specialists that come out are always friendly and do good work to see if we need anything specific. Haven't had any issues with bugs or pests in forever. Highly recommend! 350.00 was more than they regulary charge.i am very unhappy with this company I will never recommend them .its bait and switch!! I get the green thumb service so that I don't have to worry about my dog. The technician pushed a trunk in front of my dog door so that my dog was locked inside all day. No one called me to tell me that this was done. No other technician has ever done this before and my dog ended up locked in the house all day. Luis is always prompt, courteous and makes sure to ask me about any pest issues. When he came in between my bimonthly visits for an ant issue, he dealt with it cheerfully, promptly and effectively. Wonderful service! it's all good. The bugs are heading for the hills. Timely, efficient and considerate of resident's privacy and property. Answers questions with good information about spiders, other pests. We have had two experiences with Heart's and could not be more pleased with the service and staff. I highly recommend this company for attic cleanup and trapping for mice and spider spraying. Friendly on the phone and quick to get me an appointment for tenant. The technician called me prior to his arrival to go over what the tenant was experiencing (ants) Followed up after the service and let me know what treatment he had done. I am definitely putting them on my speed dial! David was very professional and did a great job answering our questions. Your choice of service techs is always excellent! I've used your service for years and have NEVER been disappointed. Christian is my usual tech but Luis showed up his time and was super helpful with a new roach and ant problem I have. He happily went the extra mile to do extra treatments inside and gave helpful pointers. Thank you! David was fine, but I reduced the rating by one star because I believe my scheduled maintenance is the third and not the fourth Monday. Please confirm. Squirrels seem fat, happy, and robust. They knocked the tops off most of the bait stations and still dig in the garden. Luis was wonderful - great service and he knew a lost! I have video of Robert arriving at my house today, knocking on my door and waiting to confirm that no one is home, then filling out a bill and leaving it in my backyard, with NO SERVICE PERFORMED. All of this within 5 minutes. I will be contacting your company to get my money back from the last 5+ years of fraudulent service as I have no idea whether this has been a scam the entire time or not. On top of it, we have an ant invasion in our house today, which if anything, you have caused by making us believe that it's being treated! And now you ask for a review?! What a scam!!! Save waa fantastic. Prompt and polite. Great communication. Very honest company. Great job, always pleasant and helpful. Kudos!! Always works around boxes and items in the way. Always prompt. Very knowledgeable and professional. Super grateful for your help. Jay was very friendly and knowledgeable. We had ants inside and he helped us to hit all the affected areas. The ants were gone within a few hours. Thank you for your service. I love the "green" option. Was disappointed in the technician. He didn't move items when he sprayed. My husband watched him spray a dust pan instead of moving it aside. I understand that it's not his job to move items, but a little bit of effort would have been appreciated. The previous technicians have been better.